The Canistel (Pouteria campechiana) is an evergreen tree native to southern Mexico and Central America. It is cultivated in other countries, such as Brazil, Taiwan, and Vietnam. Its binomial name is derived from the Mexican town of Campeche, where it is native. The canistel grows up to 10 meters (33 ft) high, and produces orange-yellow fruits, up to 7 centimeters (2.8 in) long, which are edible raw. Canistel flesh is sweet, with a texture often compared to that of a cooked egg yolk, hence its colloquial name of "eggfruit." 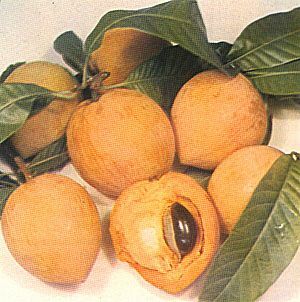 It is closely related to the Mamey sapote and abiu.